Journalist startups are not only rising from hip north California. Take India, for example. Last year, Reuters and the University of Oxford published a list of new journalist platforms from the country of curries and cricket. Inshorts is one of these startups. Through an app, the platform serves users with news stories that only take a minute to read. Inshorts doesn’t produce news as such; they rather take articles from other platforms and shorten them. The cool thing about Inshorts is that it works a bit like Blendle. The user gets to tell the app which sources and genres he or she in interested in, and Inshorts makes sure the user gets a personalized newsfeed that only takes minutes to consume. Whenever really interested, the reader can also read the full stories within the app. So Inshorts kind of works opposite to the clickbait mechanism. Where clickbait always leaves you wondering and craving for more, Inshorts tries to satisfy your information needs while giving you the option to more in-depth and nuanced versions of the summaries you’ve read. Is it useful to study journalists? Is it? Because I honestly don’t know anymore. Journalists study the world and try to present a comprehensible account of it to their viewers and/or readers. Scholars study journalists, and I’m not sure if I understand their purpose. They don’t seem to have this watchdog-like vigilant aspirations journalist have. In my eyes, most academic work on journalists seems a bit platonic. Authors study various types of journalists and journalism, and try to abstract some sort of essence from their findings. We, starting journalists, sometimes do the same thing. Whenever we have a discussion, either on a friendly basis or during a JPS-lecture (okay, mainly during JPS-lectures) we look at something like Geenstijl or Zondag met Lubach or Ismail Ilgün and ask ourselves: is this journalism? How ‘journalism’ is this? In the same way a platonic would ask about a horse in how far it represents the true ideal of a horse, as it only exists in the transcendental world of ideas. Not being a platonic myself, I notice myself finding it harder and harder to reflect upon my future profession in university. During my philosophy bachelor studies, I sometimes found myself irritated by the amount of academic uselessness found in endless discussions on ‘whether or not we can be sure the world exists’. Starting my masters, I really looked forward to what would be our only academic course to keep the scale even, and to keep reflecting on journalism on a more scholarly level, apart from our practical exercises. Now, nearly three months later, I find myself wondering what’s the point of analysing seems already self-evident to us: what journalism is. Am I slowly attaining the ‘hbo-mindset’? Or am I simply bored to death after three years of academic discussion, while discovering that journalistic research and writing seems more exciting and likely to have an actual effect on society than academic research does? Excuse me for this arrogant attitude towards scholars – I’m exaggerating a bit to sketch and better understand my own conflicted mind. And excuse my not so literary-driven blogpost (while at the same time having written a literary-driven blogpost would have quite defeated the purpose and the nature of my doubts). I think I’m just mainly wondering about two things and wanted to ask you how you feel about them. 1. Do you, being a former student of journalism, sometimes get this fuzzy feeling just as well? Or do you feel else / the contrary? 2. Is it even useful to study journalists, and why? McQuail, Denis. “What is Journalism? How is it Linked to Society?” Journalism and Society. London: Sage, 2005. 1-26. Print. Schudson, Michael & Andersen, Chris. “Objectivity, Professionalism, and Truth Seeking in Journalism”, in K. Wahl-Jorgensen & T. Hanitzsch (ed. ), The Handbook of Journalism Studies. New York: Routledge, 2009. 88-101. Print. The thought that computers are and can be ‘intelligent’ seems to become more and more commonsensical. The same goes for the rising fear of our intelligent counterparts taking over human jobs. Is the human journalist turning into an endangered species as well? Looking at journalism, a recent and impactful technological development is web analytics: “the measurement, collection, analysis and reporting of Internet data for the purposes of understanding and optimizing web usage.” (Digital Analytics Association 2008, 3). Through web analytics, journalists know their audiences better than ever before. Following, Dutch newspapers use web analytics to determine which articles ‘work’ and which do not. Looking from a technological deterministic stance, this would be a very clear example of technology (web analytics) determining the behaviour of journalists. Obviously, this is just the beginning. Today, the computer shows the numbers to the journalists, and the journalist still gets to deduce which are the hot topics, or what kind of headlines draw readers the best. With current A.I. development, however, and again from the technological deterministic viewpoint, it seems only logical to state that it is only a matter of time before this ‘deductive role’ of the human will taken over by computers just as well. With a few upgrades, updates and enhancements, the software will be more knowledgeable and sophisticated at telling us which stories are really hot, and what headline really works the best. Let’s distinguish modern journalistic practice into three stages: analysing readers behaviour (1), choosing topics / stories (2) and creating content (3). Today, (1) is done already by computers, while (2) and (3) still remain in the hands of, respectively, the editor-in-chief and reporters. Future A.I. development will make editors-in-chiefs – in their classical determinative sense – the first to get sacked. By that time, some human imagination will still come in handy to actually write the stories, but having a human decide what’s relevant? That will be so 2017. Literature: Tandoc, Edson C., and Ryan J. Thomas. “The Ethics of Web Analytics.” Digital Journalism 3.2 (2015): 243–258. Taylor and Francis+NEJM. Web. If you want to become a great journalist, you need to be sceptical. Some journalists manage with just a healthy share of scepticism. They’re the lucky ones. Others need to be made out of pitch-black cynicism in order to fit and survive the job. To be naïve would be killing for a journalist, for obvious reasons. That’s great, but also not great at all. We might need a little happy-go-lucky naivety to innovate the media. I noticed my lack of this naivety just recently when confronted my friends. Since a month or two, they started doing two things on a daily basis that I wouldn’t ever dare doing. First of all, they began trading crypto-currencies. One of my friends even went as far as spending half his life savings on Bitcoin and Iterium (a similar currency). His €12.000 has now turned into a digital €17.000. Secondly, some of them started dropping micro-doses of acid (lsd) every couple of days, in order to become more creative and experience life though a different lens. Even though they’re still adjusting the exact amount to achieve the wished effect, they seem quite happy about the results so far. As a beginning journalist, I could both use the money and the creativity they’ve gained from these efforts. But I’m too sceptical. That’s my problem. In my journalist worldview, crypto-currencies might just as well the very next financial bubble. And micro-doses might as well ruin up my entire life and career. So I prefer to stay the same. My guess is that this might be happening (and might always have been happening) to journalism at large. Where other professionals – advertisers, designers, filmmakers, etc. – are taking one leap of faith into the other, journalists prefer to stay the same. They are trained to distrust every new rise on the horizon. This both conserves them as critical watchdogs, as it withholds them from reaching their fullest potential. Long after Greek hero Theseus passed away, the ship on which he sailed through his adventures was still ‘intact’. 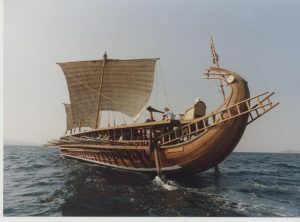 As a memory of Thesseus, the Greeks preserved the ship for centuries. However, due to the decay of the physical state of the wooden vessel, every once in a while parts had to be replaced. After several hundreds of years, Thesseus ship was still a monument in the harbour of a Greek city, while none of the parts were original. Bit by bit all had been renovated, and in a material sense Theseus never set foot on this craft. The lightly philosophical question is: is the ship still Thesseus’ ship? I had to think of this classical paradox while reading Mierzejeweska’s and Shaver’s paper about the evolution of media companies. Classical news outlets like the Volkskrant are – as they always have been – adapting to current times. Articles and titles are written in a ‘facebook-friendly’ manner, long-reads are replaced with short videos, and interactive online experiments takeover experimentation with writing forms. The question is thus: while the Volkskrant still caries the same name as it did since it’s birth in 1919, is it still the Volkskrant? The idea is, that with the internet and everyone being connected, our intelligences are shared and form a larger, vaster intelligence, the collective intelligence. In 2014, futurist philosopher Jos de Mul took this further. The further growth after Levy saw the birth of social media and the way it took their place in society. Jos de Mul speaks no longer of a collective intelligence, but of a collective mind: the further we connect digitally, the further our minds intertwine. De Mul even makes a reference to the Borg, a species in Star Trek. Borgs are separate physical beings, just like humans, but all have access to the same consciousness. They have no minds of their own but rather one, vast Borg-mind. More and more, we are becoming Borgs, according to De Mul. Do you think we are moving to a more collective consciousness? Let me know in the comments. Ever since I’ve become a day-to-day – or more likely hour-to-hour – consumer of my Facebook-feed, I have been wondering about how this new little universal hobby of ours affects my mood. The reason for my curiosity is that usually, during my practice of getting fed what the feed feeds me, I notice a subtle sense of indifference growing within me. This is something I hate: the only thing worse than experiencing negative emotion is experiencing a sense of none emotion at all, in my opinion. Whenever you feel angry at something, you at least care about the subject that you’re angry about. Whenever you’re indifferent, it’s because you don’t care at all. So the question I would like to ask everyone who stumbles upon this blogpost would be the following: how does your feed generally affect your mood? And what do you think is the nature of Facebook in a ‘moodical’ sense, compared to magazines, newspapers, news- and talk shows? Let me know in the comments! Schuck, Andreas R.T., and Alina Feinholdt. (2015). “News Framing Effects and Emotions.’ Robert Scott and Stephen Kosslyn (Eds. ), Emerging trends in the social and behavioral sciences. On September 13th the ‘letter of the day’ in the opinion section of the Volkskrant featured the letter from economist Edwoud Jansen. According to Jansen, pleads to teach non-tech experts how to program computers are nothing more than fashionable bullocks. His opinion – on which I will come back in a little bit – is in odds with the views of Caplan and Boid, as expressed in their paper ‘Who Controls the Public Sphere in an Era of Algorithms?’. The ‘who’ in their research question are partly the programmers of news algorithms, who indirectly determine each of our Facebook timelines. These programmers possibly lack knowledge in ethics. Therefore Caplan and Boid suggest to teach ethics to the programmers, and similarly, to teach students of the humanities how to program. In this way we can control our public sphere as a society. Together. But with the knowledge gap inevitably following his beliefs, how can we as a society, as a whole, share values and viewpoints and distribute these in an egalitarian way on social media like Facebook? Jansen’s ‘solution’ seems more than a little short-sighted to me. Caplan, R. & Boyd, D. (2016). Who Controls the Public Sphere in an Era of Algorithms? Data&Society, p. 1 – 19. Ewoud Jansen. (13th of September, 2017). Pleidooien om iedereen te leren programmeren zijn modieus gelul. De Volkskrant. Proudly powered by WordPress • Theme: Bosco by WordPress.com.